This Tuesday 25 April is the ANZAC Day 2017 public holiday. Several ANZAC Day road closures in the City of Perth and around Kings Park have been brought forward to facilitate safe crowd and vehicle movement. This was a joint decision made by Main Roads Department, City of Perth, WA Police and RSLWA. Victoria Ave and Adelaide Terrace intersection — to close at 0300 on 25/4/17 not 0600 and road closure now extended to Bennett Street intersection. Additional road closures and ANZAC Day Parade routes remain the same. Further information is available at rslwa.org.au. The service will be conducted at the State War Memorial on Fraser Avenue commencing at 6am. 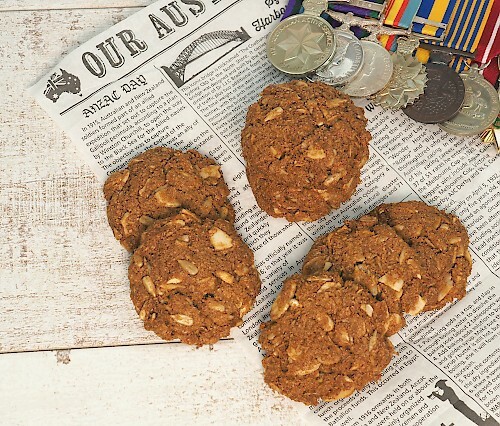 Sue offers a story from her grandfather’s diary of his service in Gallipoli — documented in Ian Gill’s book Fremantle to France 11th Battalion 1914–1919 — and a paleo-friendly, gluten/oat/wheat/refined sugar free ANZAC biscuit recipe. Buses to Kings Park will also be busy, so Transperth recommend getting into the city and on a bus as early as possible. Please note while buses are accessible, some of the locations they’ll be operating from (eg. within Kings Park) are not accessible. Please refer to the RSL website for detailed information and assistance. All other buses will run to a standard Public Holiday timetable and some deviations will be in place due to CBD road closures. Check closer to the time for service disruption information. Route 621 will operate between the Vietnam War Memorial and the coach terminus near Wadjuk Way between 4.25am and approximately 9am. Two large screens will be installed behind the monument, with a third screen installed further down the hill on the High Street side of the reserve so that all attendees can clearly see the service on the cenotaph. Transperth trains to Fremantle will depart Perth Station, Platform 7 at 3.47am, 4.02am and 4.32am. Connecting shuttle buses to Monument Hill will depart Fremantle Station, Stand 3 from 4.30am, with return shuttles back to Fremantle Station after the Dawn Service. Transperth InfoLine on 13 62 13 (13 14 50). Hearing or speech impaired? Call via NRS 133 677 and ask for 13 62 13. For other commemorative and ANZAC Day services and FAQ, visit rslwa.org.au.